The day after Thanksgiving I make a 45 minute drive to Loweland Farm in Middleburg, Virginia, to purchase my Christmas tree. They are open for tree sales exactly seven days (Thanksgiving Friday, Saturday and Sunday and the first two weekends in December). Most Frasiers are grown in a limited area of the Southern Appalachian Mountains at higher elevations in portions of Virginia, North Carolina, and Tennessee. For many years the Farm contracted with a grower nearly at the North Carolina border to cut trees just for them. 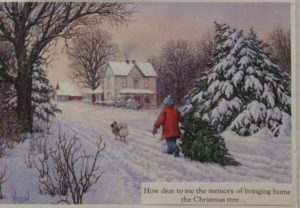 The trees would be harvested just before Thanksgiving, brought to the farm, and then each tree sat in its own bucket of fresh water to preserve the freshness. This year when I surveyed the Frasiers, I was disappointed in the selection. The trees were as amazingly fresh as always, but the branches weren’t as tightly spaced together so there were gaps between each level. Well, guess what? I didn’t make a 90-minute round trip to come home without a tree, so I chose one that ended up a tad lopsided with branches that stick out here and there like my hair does when I use too much thickening spray for that “natural” look. But here’s the upside: I had enough room to tuck larger lights into the tree next to the trunk; that provides an unusual effect. And while this is not the widest tree I’ve ever had, the wide-gapped branches provide more room so that every ornament is able to have its own space which means you can actually view each one to appreciate it. Perfect is so boring. Unpredictable individuality is much more interesting and it produces rewarding reactions. That’s true whether you’re a speaker in front of an audience or a guest in my home sipping hot cocoa while admiring my tree. I want a picture of your “less tha perfect treel. I have missed your blogs for the last month for some reason. Just received this one today. Welcome back! Don’t know what happened before but hope it doesn’t happen again. Keep up the good work. Norma people thought I was crazy because I always asked for the not perfect tree for exactly the reasons you listed here. Please remind me next year about this place. Maybe we can make a caravan trip from Warrenton to Middleburg. Comcast, for some reason, takes your site away from us. So, like Nancy Carol, I, too, am glad to have you back.. It sure sounds like a cozy idea to be sipping hot cocoa with you while admiring your always beautiful Christmas tree. Why did you ever move so far away, dear sister? I think all of my Comcast.net subscribers need to get together and make a group complaint to Comcast! i have said many times, that our tree would probably never see a Christmas, if we didn’t buy it!!! I’m sure your’s is beautiful. Why don’t you come for lunch this week and admire it? I would love to come by and see your tree and especially you. I’m on 24 hour duty with Melba, my mother-in-law. We have not been to church for the last 4 1/2 months. She currently is on hospice at our home.